Back again after another successful sheep trip! 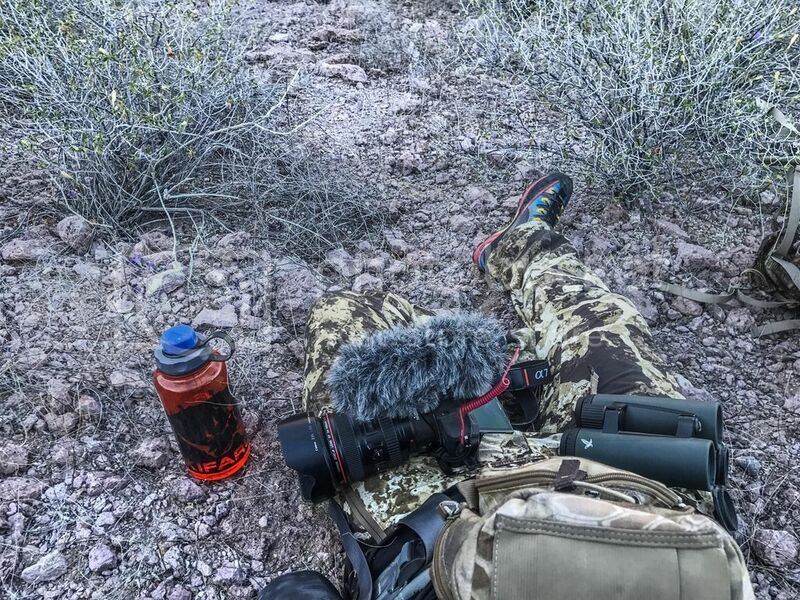 This time I was following Bob Faulkrod with the camera looking to capture his 4th Desert Sheep adventure. When I heard it was on Tiburon Island I was super excited because that's such a special place for sheep hunters. We arrived in Hermasillo Mexico and were picked up by a couple of our guides and taken to Kino Bay where we would take a small boat across to the island. 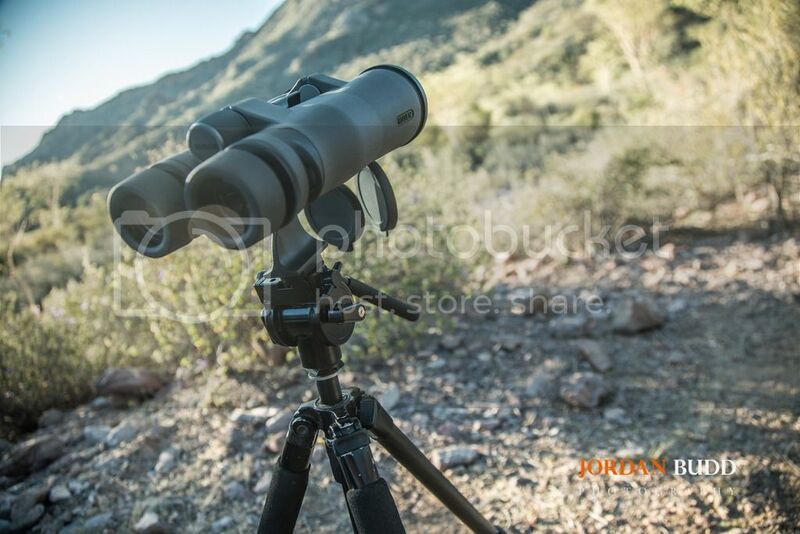 Bob used a Best of the West 7mm and Huskemaw 5-20 scope for the trip and after checking it at 200 and 500 yards we were ready to roll the next morning. 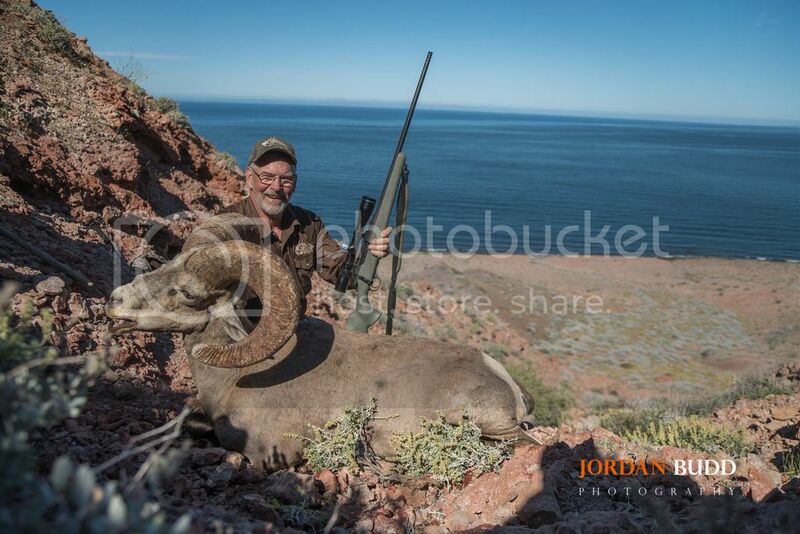 The first morning we arrived at a glassing spot at first light where we spotted a mid 160's ram about a mile and a half up a canyon. The other hunter (Dale) wasn't quite as picky as we were, but wanted to look for a bigger ram, so we passed. We drove another 5 miles or so and some of the guides split up to different ridges to look for sheep. Not 10 minutes into glassing we got a radio call that one of the guides had 2 rams spotted together a long ways up a canyon, looking to be both hovering around 180 with the heavier ram hoping to hit 185". The ram was thought to be one that some other outfitters had been after all year long, but could never get into rifle range without the ram slipping out the back door... he was really smart. After beating feet up to the guides the rams had bedded up above a ledge split up.. so one could see all the way down the canyon and another all the way up. We hit the dry creek bed and worked our way up over boulders and rocks until we got a radio call that the rams had been spooked by ewes and young rams playing on the rocks below them and went over the top. 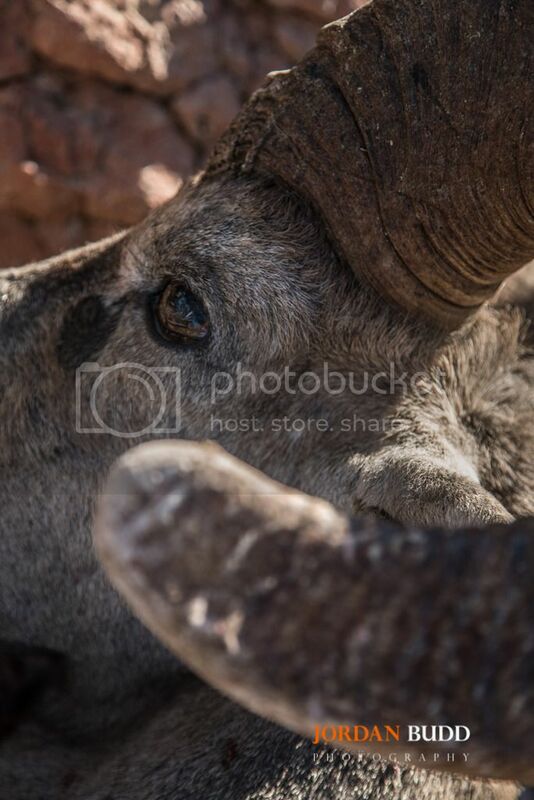 The next day we went back to the same areas, this time glassing up a 170 type ram in the first canyon and Dale decided he wanted to make a move on it. We had a ridge we figured if we got to we could get a better look at the ram and hopefully be in range. We got into a pretty sketchy cliff situation when reaching the ridge and weren't able to get down the other side and were much farther from the sheep than we thought. With the sun rising the sheep went over the other side to stay in the shade, so we backed out hoping the sheep would come back over that evening. That evening we tried a different approach into the area, coming up from the bottom hoping to close some distance then get elevation for a shot. Some smaller sheep and ewes killed our plan though being in the middle of our route with no way above or below them without being seen. So back we went, with another approach plan for the morning. While we were doing that stalk another couple of guides had gone into the second canyon glassing for the big 180's. As we were getting back to the jeeps we heard a couple calls on the radio from the guides... "We found that sheep.. just came over the top and is sky lined now, and.... he's f****** big!" He'd been seen in the same bowl for the last 3 days in a row, so made a game plan (felt like a hit plan) for the next morning on him. We left camp earlier that next morning so we could start walking in the dark up the bottom of the canyon. It was a long ways in there with some bad boulder and cliff type terrain to get through. We left most of the crew back on ridges glassing into the bowl hoping to pick him up at first light and be able to give us an idea on location. The best scenario would put us on the bottom side of the bowl with the sheep towards the top 1/3 (where he had been) and give us a 5-700 yard shot we predicted.. very simple shot with our equipment and how much Bob had practiced. We were about 400 yards away from the bowl, being easy but steady in our approach, when Travis (our guide) caught movement, glassed up and said he's right there get down. The big sheep was way lower and further down the canyon than he'd ever been. He didn't really know what we were but was steady moving up the bowl... 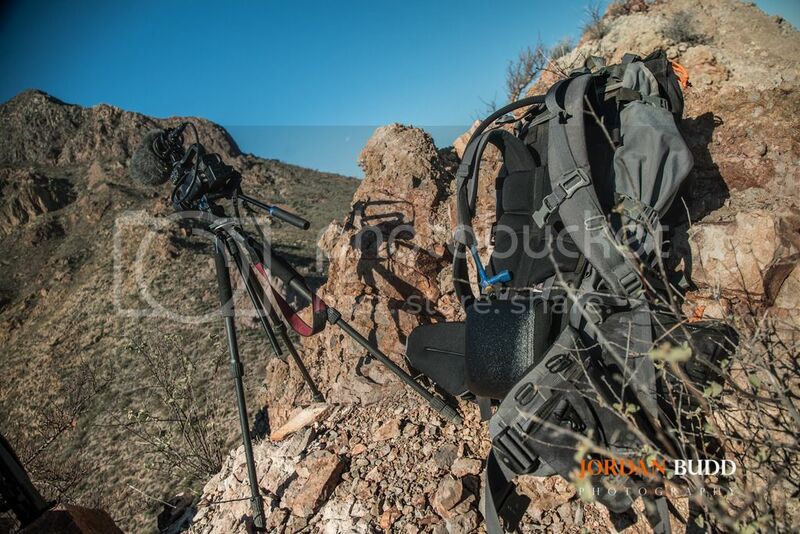 I got the camera setup and we were all giving our packs to Bob to get the rifle setup to clear the brush. Just as everything was coming together, he dumped over into the next drainage. Not bumped very hard, but with a smart old big ram like that, we knew chances of him returning in there were pretty slim. The next few days we glassed up some smaller rams, made a couple stalks that didn't pan out and decided to split up, so Dale would go one way and I would stay with Bob and go another way. On the 7th day we left camp at 3:30am to make a 3 hour drive to the north side of the island to check out some new country and find some bigger rams they had seen there on previous hunts. The drive sucked, on really windy dusty rocky roads with sharp bushes smacking you. We were on a huge flat with mountains on both sides at first light glassing up sheep. Mediocre rams here and there with ewes and lambs everywhere. We were moving from area to area when our guide said let's swing over here towards the ocean... there's a "hole" I get lucky in sometimes. 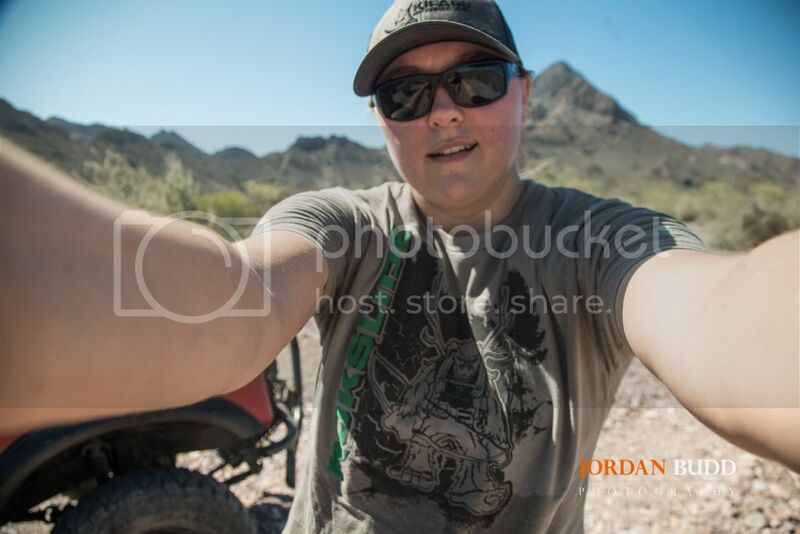 We hopped out of the jeep and I was gathering my camera stuff and eating a probar while the guide walked out to look into the hole... sure enough within 5 seconds he tells us to get low and get out to the ridge fast. Bob grabbed his rifle and I grabbed cameras, tripods and took off right behind him. When we got up to the ridge the sheep was on a ridge 500 yards from us with the ocean in the back drop. Probably to coolest kill shot scene I'll ever get. Bob checked in his spotter and said "oh yeah we're going to shoot him". I was set up behind Bob and offset to his right with 2 cameras rolling, and he was setup for a sitting shot off his tripod. 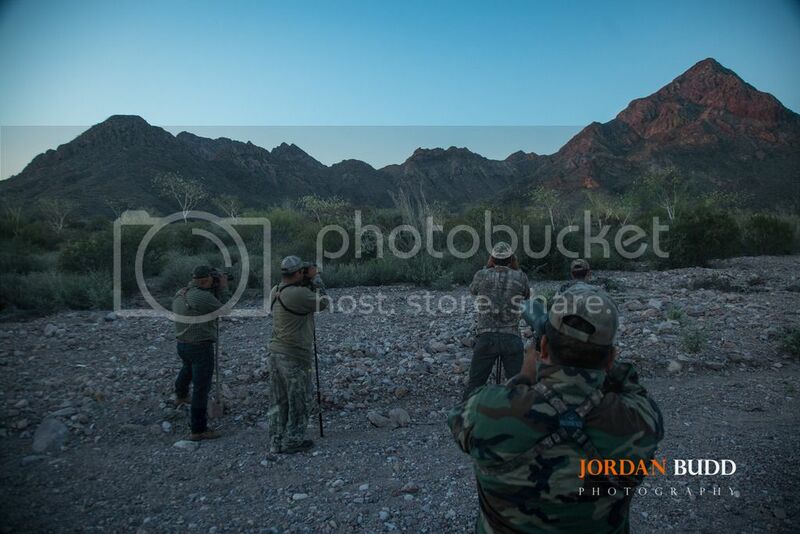 Dialed to 500, said "here we go" and let him have it... first shot I was pretty sure he hit it but I couldn't quite tell where... the sheep walked up the ridge another 20 yards and stayed broadside.. BOOM, "Jordan where'd that hit?".. "I'm pretty sure you hit him there too but I can't tell".. after another 20 yards up the ridge he went broadside one more time. This time Bob added a couple clicks and sent another round. This time he dropped right in his tracks and tumbled off the other side of the ridge. And just like that we went from a low with only a couple days left to tagged out on a great sheep. We dropped off into the bottom and made our way around the bottom of the other ridge where we glassed the sheep up 1/3 of the way down the ridge expired. Bob had hit the ram all 3 times in good spots, he just took it like a champ, we were very surprised he acted so good because the bullets definitely did their job. 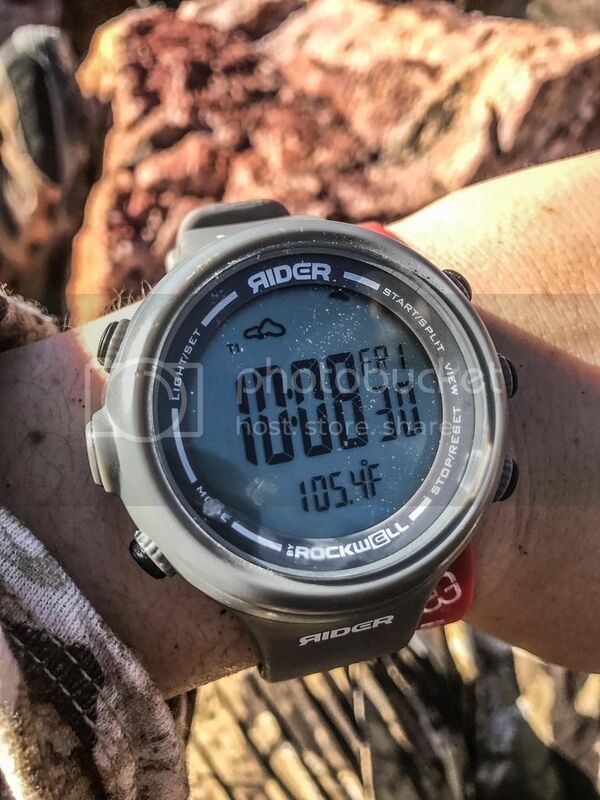 What an adventure we had with 100-110 degree days hiking around with heavy packs mostly filled with water. I went through about 15 bottles of water per day with mixing Mtn Ops Ignite and Scivation xtend drink mixes everyday to keep up electrolytes. I never cramped up surprisingly with how much we were hiking and how much I was sweating. Still haven't scored the ram but he's looking to be that 173-174 class. After pictures, video stuff and packing the sheep out of the freaking steep hole, we headed back to main camp. When we got cell service we made contact with the other guys and learned that Dale had shot a nice ram as well that morning. We met up at the Marine base where we cracked a couple Tecate beers and swapped stories. Like most hunts the memories and friends made will last forever! 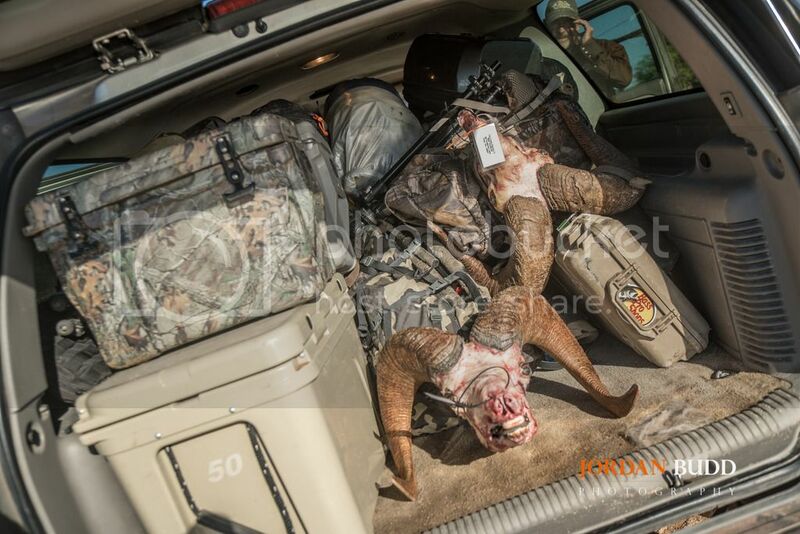 This hunt will air on Best of the West TV this fall on the Pursuit Channel. Great story and can't wait to see the episode on TV. The Best of the West has always been one of my favorite shows. Awesome ! Thanks for the back story ! Great photos and write up. Enjoyed the story and photos very much, thanks for posting Jordan. That's cool. I haven't seen Bob in ages, glad he is doing well and still getting it done!